Fluke is offering its entry-level Fluke Ti9 Thermal Imager at a reduced price for orders placed before 30th of September – £1650 instead of £2090. Rated to IP54, the rugged Fluke Ti9 is ideal for electrical applications, being robust and optimised for work in harsh environments. This special offer price also includes the Fluke SmartView software for generation of professional reports. 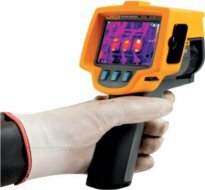 The Fluke Ti9 Thermal Imager, with 160 x 120 pixel resolution, delivers clear, crisp images to find problems fast, revealing the smallest details with the widescreen format colour LCD display. Featuring an intuitive three-button menu, users simply point the instrument from a safe distance and pull the trigger to capture the full image.